This years’ new production ‘Utopian’ is a spectacular fast-moving live performance which promises to keep you sitting on the edge of your seat. 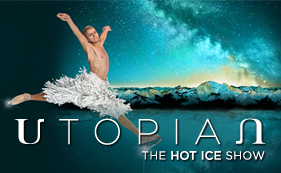 The show is choreographed by Oula Jaaskelainen an Olympic athlete, who creates excitement by encouraging the performers to skate at high speeds with intricate footwork and spine-tingling jumps. The assistant choreographer is Lynsey Brown and she and Oula work together to inspire the skaters with their unique styles. A DVD of the show may be purchased online or at The Pleasure Beach Arena. Many previous Hot Ice soundtracks can be found on iTunes. DVDS and soundtracks may also be purchased from the Pleasure Beach website or on site at the arena. This show is suitable for all ages and a must see for fans of live entertainment. Shows run from Monday through Saturday with performances at 2.30 pm and 7.00 pm. You can experience Hot Ice at a Matinee or Evening performance. Please note Matinee 2:30 pm performances have a running time of 50 minutes and evening performances at 7pm have a running time of 100 minutes. All guests who purchase a Hot Ice evening and matinee ticket will receive a free Pleasure Beach Pass to experience the UK’s number 1 Amusement Park. You can experience Utopian at a Matinee or Evening performance. Please note Matinee 2:30 pm performances have a running time of 50 minutes and evening performances at 7pm have a running time of 100 minutes. For Group Rates, please call 0871 222 8787 or email [email protected] for further details. If you do not wish to book online alternatively you can call the box office on 01253 341707 Calls will cost 13 pence per minute plus your telephone companies access charge.